These photos show the development of what is possibly a supercell thunderstorm. 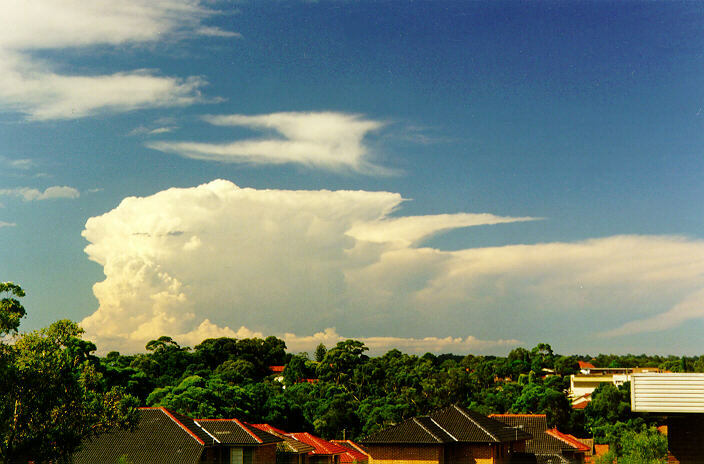 Supercells are the most violent type of thunderstorm, producing large hail, heavy rain, and destructive winds which sometimes are in the form of tornadoes. 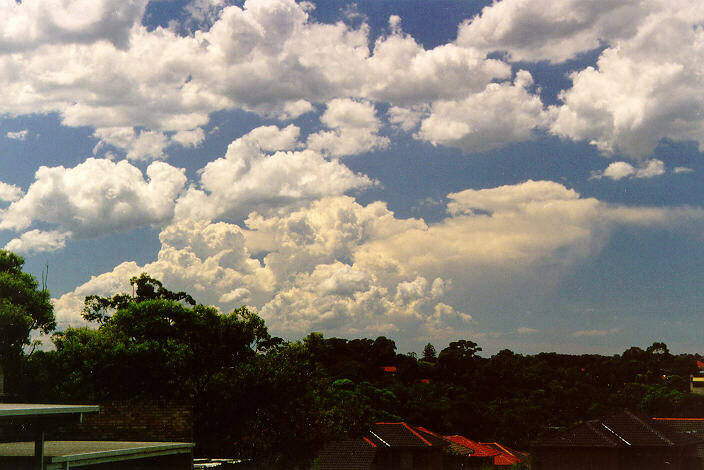 These three photos were taken earlier in the afternoon and show more distant cumulonimbus development. Four photos of the evolving supercell. The fourth image was taken about 10 minutes after the first three. 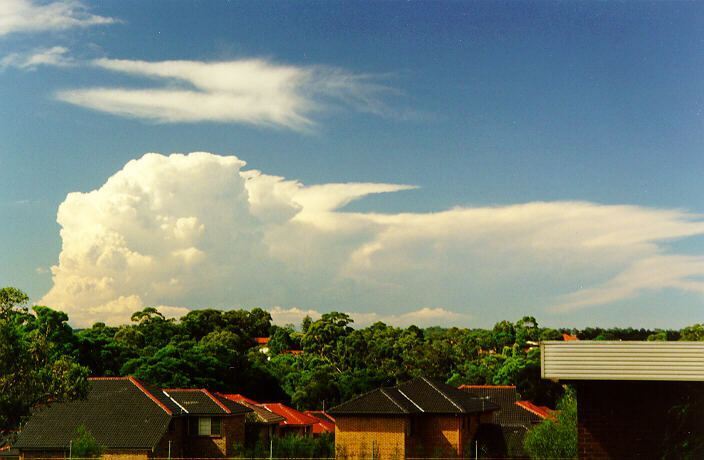 The photos were taken from North Ryde in the northern suburbs of Sydney looking due magnetic north (checked with compass) towards the central coast at about 3:30pm on the 12th of February 1998. The photos were taken in a over a period of about 15 minutes with a gap of about 5 or 10 minutes between the first photos and the last. 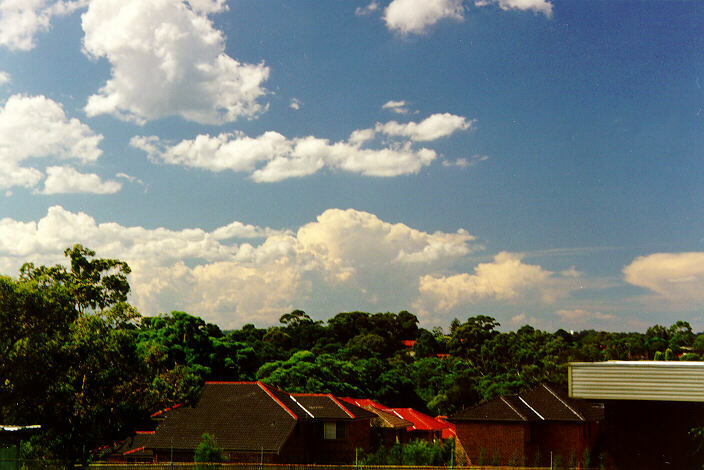 Firstly they show the presence of a strong, explosive updraught which is a feature of a supercell storm system. 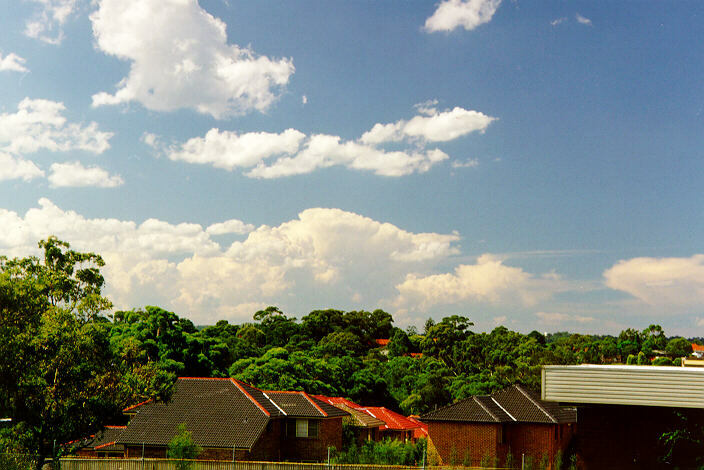 This is evident from the boiling plume on the left of the photo. You will also note that, because of the power in the updraught, it is pushing out against the prevailing upper tropospheric winds. The spreading out of the cloud at the top of the updraught is known as the anvil and occurs at the tropopause, a region about 15km high where convection, or upward motion, is no longer able to occur. In these photos, the upper tropospheric winds blow approximately from the left handside to the right so you see a general spread to the right. You will notice though, a slight spreading to the left which demonstrates the power in the updraught as it pushes against the upper troposheric wind. In the last photo, you will notice a slight upwards bulge in the anvil. This is known as the "overshoot phenomenon" or overshooting top and is a direct result of a very intense and powerful updraught pushing beyond the tropopause into the stratosphere. Another characteristic of this storm, which is also characteristic of severe storms is the smooth, crisp, anvil - again a result of a strong updraught. All these features: boiling updraught, backshearing anvil, and overshooting top, are characteristics of supercell thunderstorms which is what the above photos (especially the last one) show. 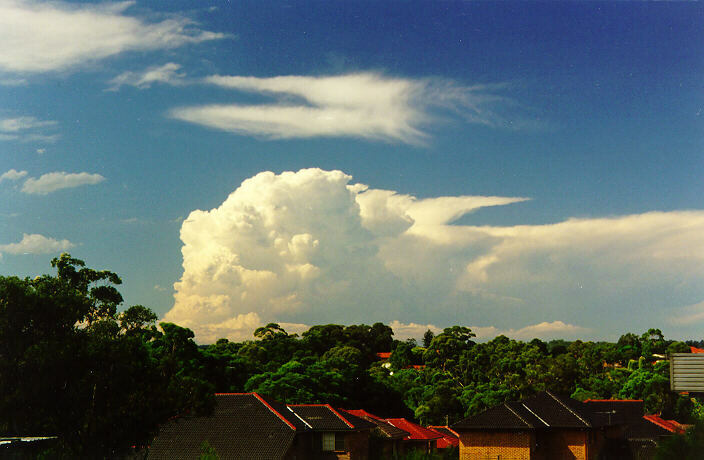 The weather conditions that allow these storms to form are usually of high heat and relative humidity, low atmospheric pressure (often associated with a pre-frontal trough), wind shear with backing or veering (ie. different wind velocities at different heights) and a cold atmosphere which promotes strong convection. On this particular occasion, the day time temperature was in the mid 30's and there was a pre-frontal low pressure trough system.